Everyone who works in microbiology, biology, food industries, or heath industries knows they use an autoclave to sterilise equipment or discards, but unfortunately not that many understand how the process really works and what can lead to failures in steam sterilisation. For steam sterilisation to work, air is removed from the chamber either by a pre-vacuum cycle or by the downward displacement process. As the air is removed the steam can access all of the small nooks and crevices of the load. As long as enough steam penetrates the load to hit all these areas at the right temperature for the set time, the load will be sterilised. But how can you tell if a load is sterile or not? Myth - Well my autoclave tape turns black, that means its sterilised. Fact - Although autoclave tape is sensitive to steam and temperature, it is only a simple process indicator and will change colour relatively quickly when exposed to the steam process. Autoclave tape should only be used as a quick visual indication that a load has been processed, not that the process was successful. Thermalog-S is a refined integrator which gives a more precise measure of the success of the process. As the colour development kinectics of Thermalog are similar to the inactivation kenetics of biological indicators, Thermalog will only show safe if the right combination of steam penetration, temperature and time have been met. To use Thermalog-S, simply place the strip in your load at the points most resistent to steam penetration, ie the center of packs or vessels. Once the cycle is complete, Thermalog can read at once. If the blue bar has permeated into the safe zone, as above, the three critera of steam, temperature and time have been met. The strip can then be kept as a record of your process. Thermalog is also incredibly stable, having no storage problems plus a 5-year shelf life. 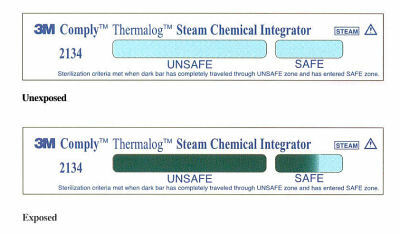 Thermalog is supplied in re-sealable pouches of 250 integrator strips. Thermalog S is a chemical integrator with a linear reaction of Z=10° C, specifically designed to integrate time, temperature and saturated steam in an autoclave. The reaction of Thermalog is directly related to the biological death curve of B. Stearothermophilus (as described in CEN Pren 866 parts 1-3 and ISO 11137/8 for biological indicators and ISO 11140/1, parts 1,2 and 3, chemical indicators for steam sterilisation). It is also capable of providing a dianostic evaluation of the cycle and can be used in all typical steam cycles, as described in HTM 2010. For further information please see The Thermalog Brochure. Call us now for more information and a sample on 01626 369990.